To create Radio Button Parameter in SSRS Report, The data type should be set to boolean for Parameter. After writing the query for your report by using bit type column, you have to go to Parameter properties and then set the Parameter data type to boolean to show Radio Buttons, Otherwise you will see a text box for parameter value. Query for report with Single Value parameter, remember IsActive is Bit type Column in table. Run the report and you will see now you have Radio Button Parameter. Range parameters are used to choose a range of values. Let's say we would like to see data between two dates. We can create two parameters StartDate and EndDate. get all records for current quarter etc. SSRS Interview Questions and Answers - What are Cascading parameters in SSRS report? Cascading Parameters are set of parameters in which values of one Parameters depends on the value choose in another parameters. It is always good idea to explain your answer with examples in interview. Let's consider below example. We have a single value parameter call Region and then on selection of Region Parameter value, we would like to display Countries related to that region in Country Parameter. The Region Parameter, you can provide static values or you can get the values from query. If more regions can be added or removed, it is good idea to get values for Parameter by using query. Let's say our table name is dbo.TotalSale which has Region, Country and other columns. Query for @Param_Country ( Multi Value parameter). Notice that we have used @Param_Region Parameter to get only countries related to that Region. SSRS Interview Questions - Is there a way to provide default value/s to your parameter in SSRS Report? Parameters are used to filter data in report. Default value/s can be configured for Parameter/s in SSRS report. By configuring default values in report, the report will run with those parameter values. The viewer/user can choose different values for parameter/s after first execution of report. Parameter/s are used to filter report data. We often has column/s in table which are date or datetime type. If we would like to use those column/s in our SSRS Report, we can create the parameter and have the Calendar icon to choose date. After using the query in SSRS Report, we will see the Text Box for our parameter. 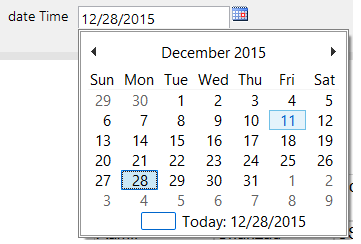 As we want to have the Calendar, we need to change the parameter Data Type. Right Click on the Parameter, go to properties and change the data type to Date/Time as shown below. Parameter/s in reports are used to filter data. Multi Value parameter is one that can accept more than one value. Let's say if we would like to create report with RegionName Parameter that should be able to accept more than one Region value. Our T-SQL will use IN clause and small parenthesis around Parameter Name. We can also write a Stored Procedure with Multi Value Parameter. To create multi value parameter, We need IN clause and each value in IN Clause should have (single quotes) around. When SSRS pass multiple values to parameter, it separate them by comma ( ,). We need to replace the comma with single quotes and comma as you can see in highlighted code. After that we can write our Dynamic SQL Query to use the value of Parameter. Parameters are used to filter the data in report. Single value parameter is parameter which can accept only one value at a time. To create your report with single value parameter , in Where clause you will be using "=" sign and Parameter name. You can also use the Stored Procedure for your report with Single value parameter/s. The where clause will be using "=" and then Parameter name as shown below. In below Stored Procedure we are only using @Region Parameter. You can create Stored Procedure with Multiple Single Value parameters if required by adding conditions in Where clause as we did in above query for Region and Country. Parameter/s in report are used to filter the data. Parameters are really useful to extract only required data as well present the data which is required by the user. Multi Value parameter in SSRS Report let the user choose multiple values for the Parameter. While creating SSRS Report, we can either provide Static values for our Multi value parameter inside the report or we can use query to extract values from database for our multi value parameter. Default values can be configured for multi value parameter as well if required, otherwise user can choose values for parameter at run-time. If a parameter is multi value parameter, you will see a drop down with check boxes. You have the option to Select All or you can choose the values what you like. For value for multi value parameter can be text, integer, date type. Parameter/s in reports are used to filter the data. Single Value parameter in SSRS is the parameter which can accept only single value. You can configure Single Value Parameter with default value or leave for user to choose before view the report data. The values for Single value parameter can be stored in report ( Static values) or you can use Query to get values from database and user can choose one at run-time. Parameters are used to filter the report data. By using the parameter/s users can filter the information they would like to see instead of looking entire data on report. SQL Server Reporting Services Reports can be configured to run with default parameter values or user can choose the values for parameter/s and then view the report. For Parameter values, you can use either Static values inside report or you can use Query which can get the parameter values from Database. In this video you will learn how to save query results in TEXT, Report or Excel format. It explains different options to save query results such as in Text file, in grid and in reporting (.rpt) format. It also shows how to save query results with header (column names) in SQL Server Management studio. In this video you will learn an overview of SQL Server Configuration manager, video discusses various options of SQL Server Configuration manager such as SQL Server component services, SQL Server network configuration 32 bit, SQL Server network configuration 64 bit, SQL Server Native client, SQL Server native client 11.0 32 bit, SQL Server native client 64 bit, SQL Server configuration client protocols, TCP/IP, Shared memory, Named Pipe. It demonstrates how to enable disable protocol for SQL Server connection, how to create alias in SQL Server, how to connect to Alias in using sql server management studio. In this video you will learn how to create Database Backup Maintenance Plan step by step. After watching this video, you will be able to create new maintenance plan, navigate to the Tool Box, Navigate to the database backup task, configure database Task, step by step walk through maintenance plan options and whether to select system database, user database, all database or selective databases. You will also learn how to view maintenance plan and SQL Server Agent Jobs for newly created maintenance plan. In this video you will learn what is database backup, why we need database backups, what are the best practices of backing up SQL Server databases. It also illustrates how many types of backups available in SQL Server, what is Full backup? What is Differential Backup and what is Transaction Log backup. It also shows different scenarios of backup strategy in real time production environment. it is part of complete SQL Server DBA Tutorial. In this video you will learn best practices of SQL Server Databases such as location of data and log files, initial size of the database, Auto growth options, collation, recovery models and some of the other important options of a database. In this video you will learn how to install sql server in cluster mode. The video walk you through step by step with all requirements to install SQL Server in Cluster Mode. In this video you will learn how to install SQL Server Data Tools. The SSDT is same like BIDS. SSDT is used to develop SSIS Package, SSAS and SSRS reports for SQL server 2012 and SQL Server 2014. This video illustrates step by step process of SQL Server Reporting Services 2014 installation and Configuration in native mode. The video shows you how to install SQL Server 2014 step by Step, It also discuss what are the requirements to install SQL Server 2014 as stand alone on your machine. By using this video you will be able to follow step by step installation for Database Engine, Reporting Services and other Components. SQL Server Integration Services (SSIS) Interview Question "What is Annotation in SSIS Package? Can we write annotation in Data Flow Pane?" In this video you will learn the answer of SQL Server Integration Services (SSIS) interview question "What is data Viewer in SSIS? Is data viewer available in Control Flow or Data Flow? " In this SQL Server Integration Services (SSIS) Interview Question video you will learn the answer of "
We can run any tasks in Control Flow Pane on Failure of a Task/s by using Precedence constraint. What are the advantages of using Event Handler over Precedence Constraints?" In this video of SQL Server Integration Services Tutorial, you will learn What are Event Handlers in SSIS Package and Where we use them? Unpivot Transformation in SSIS Package is used to convert unnormalized datatset into more normalized dataset. By using UnPivot Transformation you will be converting the columns into single column. The video explain why do we need to use UnPivot Transformation in SSIS Package. The second part of the video consists of demo that will walk you through step by step how to read the data from flat file source and then Unpivot that by using UnPivot Transformation in SSIS Package. At the end you will be able to see the data by using Data Viewer. Pivot Transformation is used to convert Row Data into Columns. Pivot transformations makes normalized data less normalized. Note : You can ignore to provide the values and run your package in debug and then copy from output window or progress window and reopen and provide in Generate pivot output Column from values text box. As I know the values for my column those are month names , I have provided by myself or I could have run the package with Ignore and copy them later. In this video of SQL Server Integratoin Services(SSIS) Tutorial, you will learn how to Export files from SQL Server Table to a Folder by using Export Column Transformation in SSIS Package. "We have a table which contains different types of files that we want to export to folder. Which transformation do we need to use? " In this video of SQL Server Integration Services(SSIS) Tutorial, you will learn how to use Import Column Transformation in SSIS to load image files, text file, pdf file and all other formats to SQL Server Table. This video is also used for SQL Server Integration Services (SSIS ) Interview Question " Which transformation can I use in SSIS to importimage files to a Table?" SQL Server Integration Services (SSIS) Interview Question "I am running my package for debugging and I do not want to load datainto any destination. Which transformation can I use to ensure that the data goes nowhere else?" In this video of SQL Server Integration Services(SSIS) Tutorial, you will learn how to use the Multicast Transformation in SSIS Package to distribute single input into multiple outputs and load into multiple destinations. In this video of SQL Server Integration Services(SSIS) Tutorial, you will learn how to write Case Statements in Derived Column Transformation in SSIS Package. In this video of SQL Server Integration Services(SSIS) Tutorial, you will learn how to convert Month Number into Month Full Name and Month Short name by using Derived Column Transformation in SSIS Package. In this video of SQL Server Integratoin Services(SSIS) Tutorial, What is FindString Function and How to use in Derived Column Transformation. "If we have source S1 and Source S2, and we need to merge them so that we get sorted output, which transformation would we use in SSIS Package?" "In Merge Join Transformation, we can use Inner Join, Left Join and Full Outer Join. If I have to use Cross Join, which transformation would I use?" In this video of SQL Server Integration Services(SSIS) Tutorial, you will learn how to use Sort Transformation in Data Flow task to remove duplicate records and only load unique records to SQL Server Destination. How to use Data Flow Task in SSIS Package to read from source and load into destination. In this video of SQL Server Integration Services(SSIS) Tutorial, you will learn how to get the insert row count and log into audit table for SSIS Package. This is real time scenario that we use to log different type of row counts such as insert, update, delete to log table for each SSIS Package execution. In this video of SQL Server Integration Services(SSIS) Tutorial, you will learn how to remove or redirect duplicate records in data flow task by using Aggregate Transformation with Conditional Split Transformation in SSIS Package. In this video of SQL Server Integration Services(SSIS) Tutorial, you will learn how to divide the the records depending upon the data points and load them to related tables. "What is conditional Split Transformation in SSIS?" The video also shows a quick demo how to use Conditional Split transformation in SSIS for real time scenarios. Conditional Split transformation in SSIS Package can be used to generate multiple outputs from single output depending upon the values of data points. In this video of SQL Server Integration Services(SSIS) Tutorial, you will learn the answer of SQL Server Integration Services (SSIS ) Question " How would you filter Null value rows in Data Flow Task in SSIS Package"
In this video of SQL Server Integration Services(SSIS), you will learn how to filter blank rows in data flow task by using conditional split transformation. The video also introduce you to write expressions in Conditional split transformation, How to use Trim functions such as LTRIM and RTRIM to remove blank spaces from data points in Conditional Split transformation. The video can be used for beginners to learn about different SSIS Transformations and Tasks such as Data Flow Task, Flat File Source, Conditional Split transformation and Multicast Transformation. The use of Multicast Transformation in this demo is only for Test purpose. In this video of SQL Server Integration Services(SSIS) Tutorial, you will learn How to Delete Top N Rows from Flat File in SSIS Package. In this video of SQL Server Integration Services(SSIS) Tutorial, you will learn How to use Row Count Transformation in SSIS Package. It is very common scenario when we need to know how many records are loaded from Source to destination. In this video of SQL Server Integration Services(SSIS) Tutorial, you will learn how to create monthly archive folders with Month Name in SSIS Package. Here are the expressions used in Demo Video how to create folder with month name in SSIS Package. MONTH(getdate()) == 11 ? "Nov" :"Dec"